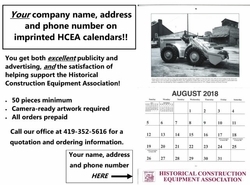 PROMOTE YOUR BUSINESS WITH YOUR OWN CUSTOMIZED 2019 HCEA CALENDARS! Order your Custom HCEA Calendars today! Make an impression: Your business imprint on each calendar. Only calendar of this type offered. Year-round exposure to your name. Great gifts for customers. 12 stunning historic equipment photos reproduced in classic black and white. A beautiful calendar you'll be proud to give your customers. Your business imprint at the bottom of the calendar in easy-to-read, bold type for year-round exposure.